The week end has been great! 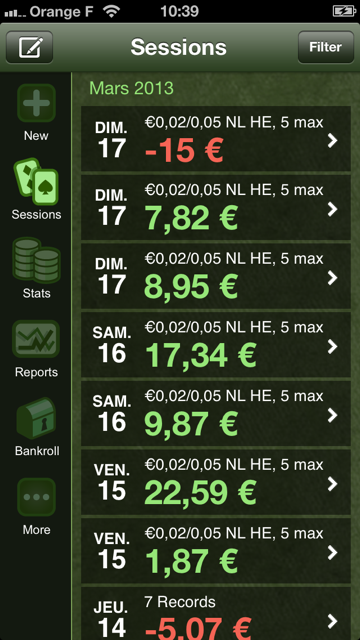 I had a really nice winning streak…until my short session of yesterday night when I was tired. But nonetheless I’ve won about 10 buy-ins since my last post. Playing with a good night sleep is really important for me, I think it explains my wins and losses since the beginning of the challenge. When I’m tired, I tend to make more preflop calls that put me in difficult spots where I take poor decisions because I am tired (i.e. I’m on tilt). Anyway it’s a good comeback and I’m now slightly above my starting point after 11 days of challenge…which is not so good. 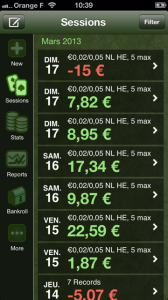 But hey, I’ve raked more than 145€ since the beginning, so I’m a big winner overall, am I ? It went really well and I was so happy…so that will be all for now guys, see you! This entry was posted in Challenge on 18 March, 2013 by Laurent.